I got myself into a bit of a commercial mode this afternoon by taking off on a thought I had a couple of weeks ago. Somehow that thought went right out of my head until I recaptured it today. I thought I'd better sieze the moment! 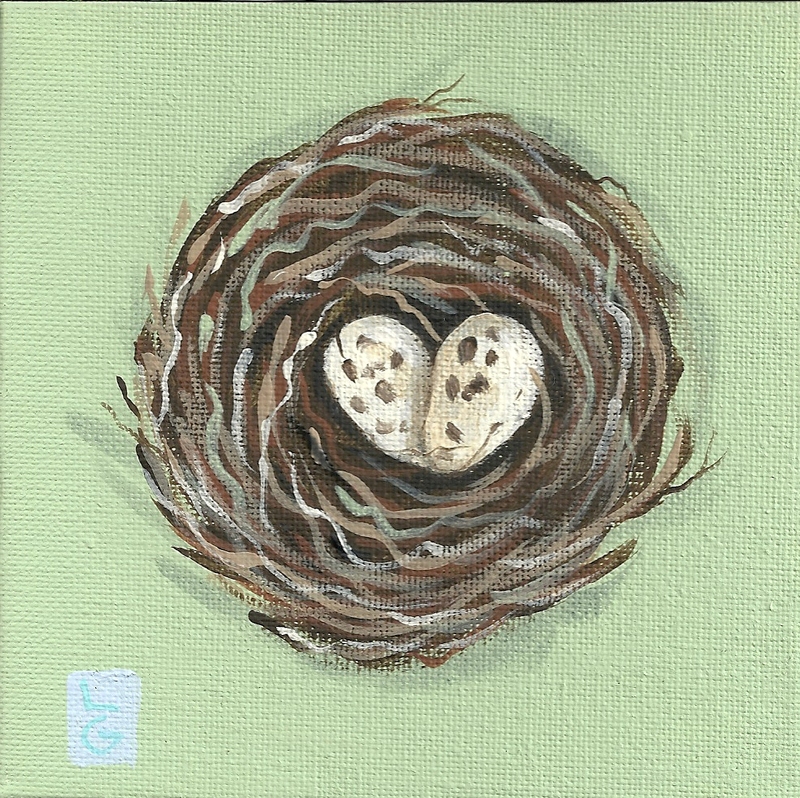 I call these little paintings "love nests" because the 2 eggs look like a heart. No really, they do. Don't you see it? It's like making images out of clouds. Well, sort of. Anyway, I've been a bit absent. A bit spotty. A tad preoccupied. 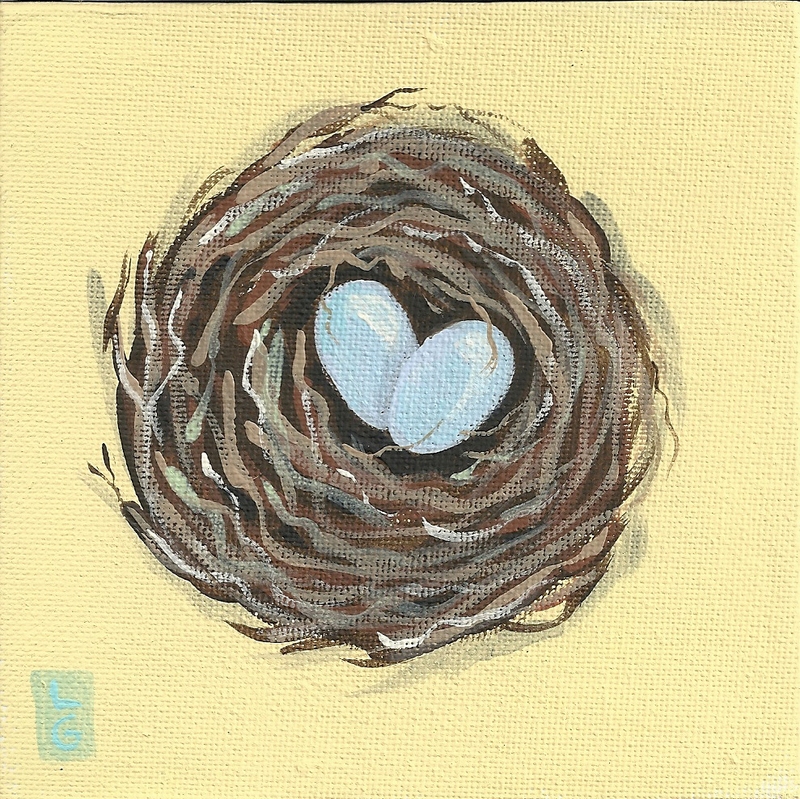 I think I needed these little love nests today. The set of four look great together; would make a lovely set of notecards too, yes??? These are wonderful Lolo. The cat in your header has a wicked look on its face like it would be happy to get into one of those nests. How sweet!!! Great idea!!! Happy V-day tomorrow! 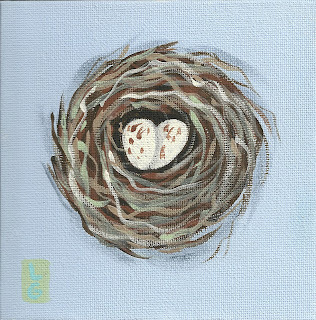 Very lovely Love Nests on Valentines Day and of course I saw the hearts right off! Missed you, glad you are back. 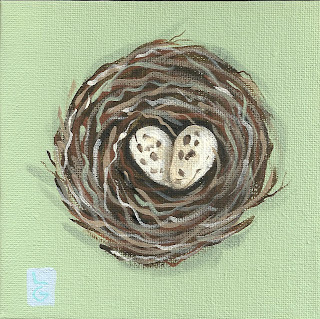 I saw the heart-eggs before you mentioned it in your post and I think these are the best Valetine's day cards I have seen: they are original, sweet and natural. I've been spotty too and preoccupied. Lots of reasons but weather is my excuse. Too confining and not getting out enough. There so tenderly beautiful,are they for sale Lolo? I love all of these, lo...so hopeful and spring-like. And yes, with a lovely heart! Exactly today Felix card arrived and mine yesterday! I am happy you are my friend and words can not express what that means to me. to you Bri Em and Bliss! These are adorable. Very clever. They would make cute cards. Wonderful! And of course they are hearts. Happy Valentine's Day! 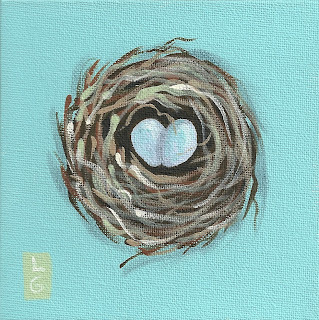 lovely and wonderful idea for these love nests. how sweet. happy v day to you a bit late. Gorgeous! Me thinks I must have one! So happy you loved my card! The momnent I saw it, I thought of YOU! i thought i had left a comment lo, i must have dreamed it when i saw these paintings i stopped thinking. they are so fantastic, i LOVE birds nests, but eggs to look like hearts, omgosh. They are all so adorable, lovely and wonderful. Love them all!I can see it:)You are great! So darling. 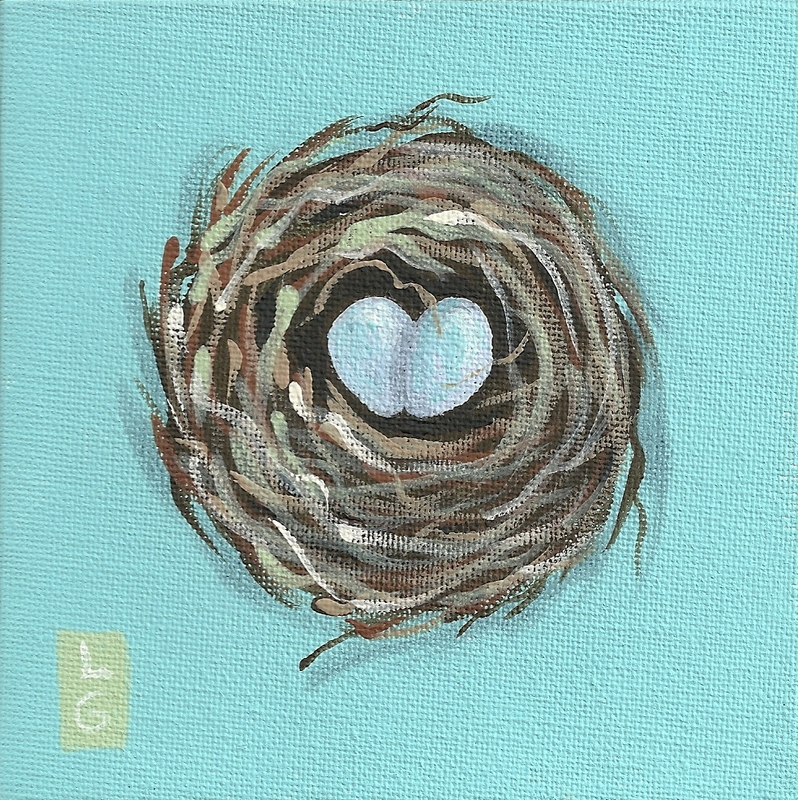 Love the little love nests. Yes, can see the hearts. 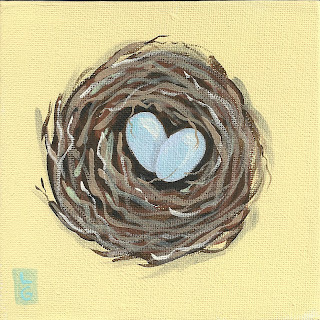 Love your "Love Nests". They are simply sweet. We are all yearning for spring. These make a fabulous series and they give off a feeling of calm. Lovely. I just spotted the tag "Spaniel' and I'll have to go investigate that. I LOVE these. I could see the hearts immediately!